We are the creators of our own destiny. We aren’t born with purpose, we find it. We find it by discovering what makes our soul feel truly alive and loving every minute of the journey as much as the destination itself. Have you ever felt like you were flailing around with no purpose, no direction and no idea what step to take next? I’ve been there; I’ve felt the same as you do now. But, after constant searching and figuring out what I needed to do, I’ve found my purpose. Today I want to share my story with you, but what’s important is not what my purpose is, it’s how I discovered it. 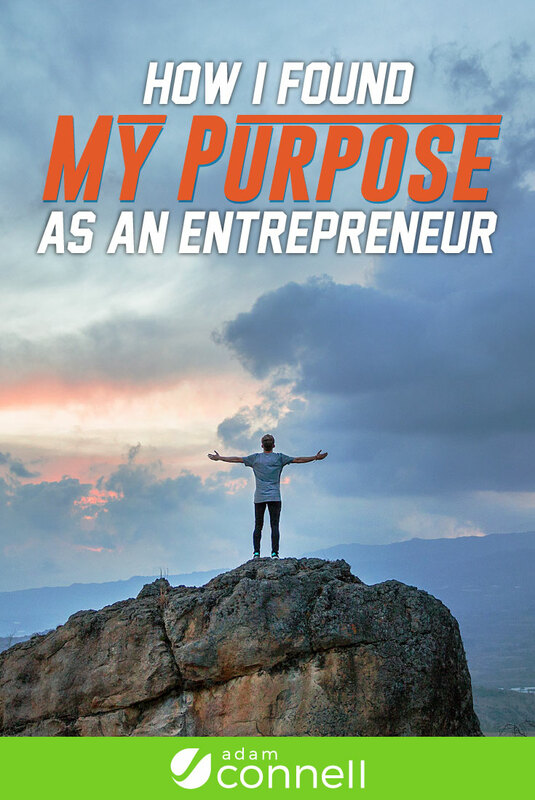 Follow along with my story and use it to help you find your purpose – it’s easier than you think. It all started at college. I was studying music technology and while it was a big part of my life, I wanted something more. I hadn’t found my purpose. As time went on it was apparent that I was just going through the motions. There was so much more to life but what else was there? That wasn’t clear at the time. I was struck with my first business idea – to start a record label. Music was the focal point of my life at the time and I wanted to help my friends promote their music. It was a complete failure from a financial perspective but the real truth was that it had done so much more for me. The experience exposed me to a wider world; I left my comfort zone and ventured into the unknown. Failure or not, I started seeing pieces of a bigger picture start to fit together. It was more than that. It motivated me; it gave me the thirst to learn more. The thirst to learn more led me to research into an underground music scene; known as “netaudio”. The idea was simple. People making music for the love of music, the financial side of things don’t come into it. I began immersing myself in this new culture I’d discovered. It was apparent that this could be the way to accomplish something with my failed record label. Within a few weeks I started releasing music for free. 6 months later I had released more than 10 albums and reached over 100,000 people. Then 12 months after, we hit 500,000 downloads. All with no marketing experience. This proved what was possible with the internet but it definitely didn’t help pay the bills. I was at a cross roads. My college course was drawing to a close (I was studying music technology) I was good at it but the future seemed so unsure. I was bitten by the marketing and entrepreneurial bug but I didn’t know how to take it that step further. Then I was struck with inspiration. A lecturer from a local university visited my college and presented a lecture on smart ways to use savvy digital know-how to get our music visible online. His name was Carl; he was incredibly passionate about business and music. The lecture changed everything, instead of typical lectures that were unimaginably dull – I was on the edge my seat. My mind was going crazy at the possibilities. And at that moment a few more pieces of the big picture were revealed. I went to university and wrote a dissertation on music marketing. The level of research required was intensive but that learning curve showed me so much more of what was possible with the internet. At that point, it was clear – marketing was my new found direction. The entrepreneurial side of things wasn’t apparent to me at the time but I was on the right track. An insatiable thirst to learn more but there was a problem. I had the passion, but I didn’t know how to break into the industry. So the result was the same as most of my friends did – I left University and entered full time employment. Not a job doing what I enjoyed, just a generic job to pay the bills. Surely there was more to life than this? And there was. Taking action was the key. I spent every waking moment learning; reading blog posts, watching video courses and more. Then I started tinkering, building websites, promoting them, trying to get the word out. The entrepreneurial vision started to unfold but was it really possible for me to earn money on the web? I kept my foot on the gas and it finally happened. …The earnings from my first website came in, a cheque for $250 – it was an incredible feeling. So many people had told me that this idea of making money on the web, the digital entrepreneur thing was a joke, it couldn’t be done. But this proved it to me, it could be done. Within a few months I had earned my first $1,000 through my own online business. Shortly after, the business tanked. Was that a bad thing? At the time that was exactly my thinking but the reality is that it was a stepping stone to something greater. I had to make that mistake. It was better to make the mistake early on than wait till later. At this point I wasn’t quite sure where this was heading. All I knew was that I loved what I was doing. I had found my calling but I still found myself grinding away in a full time job I grew to despise. After seeing the success I had and then losing it all, I felt like I may be locked in my job forever. This was a setback, but it didn’t last forever. The thought that creating a business was a bad idea entered into my mind. But the skills I’d learned in the process were still there, that gave me a way out of my job. So, I picked myself up, dusted myself off and decided to try switching jobs. Marketing was my thing but I lacked qualifications. I had a degree but it was in music. All I had was experience, I’d built websites, marketed them and been incredibly successful on a shoe string budget – sure it didn’t last, but I could do it. That kind of belief matters. Every day for 4 months I scoured job sites trying to find something I’d enjoy – I didn’t know what role I wanted to do or the type of company I wanted to work for. I just looked for something that would feed my passion. Then, out of the blue – eureka. I found the perfect role on a popular job site. It was a position working as an assistant for a digital marketing agency close to where I was living at the time. The competition for the job was fierce; I was going up against qualified marketers. A few days after the interview, I got the call – the job was mine. The short answer is – experience. The fact I didn’t have a shiny piece of paper saying I was a qualified marketer didn’t stop me at all. All the tinkering with websites, building them, marketing them and learning as much as I could had paid off. Within a month I left my previous job and started my incredible new role. A short time after I was managing a small team and I soon worked my way up to the position of Operations Manager. This is what happens when you are passionate about what you do – you approach the job with a tenacious attitude and you make things happen. This role gave me the opportunity to do what I enjoyed on a daily basis, and soon after I launched Blogging Wizard – a site where I share actionable marketing tips for bloggers. For a while, I felt like I was on cloud 9, then I hit a bit of a roadblock. I loved what I was doing, both at work and with my blog. I got a lot of fulfilment out of it. But the truth is that I was caught up in the moment. I had a plan that was fluid and that was a good thing but it wasn’t specific enough to give me the direction I needed. My wheels were spinning and I plunged myself further into my job. I took my work home with me, spent every waking moment juggling it with other business ventures. I was frazzled, tired and too stressed to function effectively. That’s when my boss/mentor (Jason) stepped in. He could see I was burning myself out and in a way seemed to understand how I felt more than me. You need a plan, a specific plan. It doesn’t have to be set in stone, but you still need a plan. Write out a 5 year plan; include everything you want out of life and how you want to feel. Not just from work or business – everything. Then break it down and decide what you want to achieve in 3 years, 1 year and 6 months. So I started putting this advice into action but I kept thinking. The basis of this idea was so simple, how come I had not thought about this before? My day to day role required intense planning both for myself and clients. Everything was process driven. It was crazy to miss out something so important like having a specific plan for my life. Why does this work so well? The idea behind this plan is that as humans we crave completeness and once we put together a plan (on paper), it becomes more real and our minds subconsciously start leading us to our end goals. It alters how we make decisions and ultimately helps us to gravitate towards our goals, sometimes without realizing it. I also created a dream board based on this plan – it was in the form of a PowerPoint presentation that I watched every day. This helped me visualize my dreams. Have you ever used a dream board? (Let me know about your experience in the comments below). Soon after putting Jason’s advice into action, things changed. I was more focused, I had direction and my performance was better at work. Blogging Wizard started gaining some serious traction and everything began to fall into place. 18 months later and my blog had reached the point where it was earning enough money that I could leave my job. It was a difficult decision because the role I was in changed my life in so many ways but if I was going to realize my entrepreneurial dream, I had to leave and focus on growing my own business. My first few business ideas didn’t fly but I’d learned so much – I was ready to take the next step. And that’s what really made the difference to my life as a whole. … Taking that leap of faith. While I haven’t completed my plan, I have taken huge strides that I never imagined I’d be able to take. I’ve reached the point where I have been able to launch new business ventures and expand my team. But there’s a lot more on the horizon. Being an entrepreneur was never something I set out to be but that’s where my passion has taken me. And that’s the key to it all – the passion to learn and the drive to take action. I never set out to just do one thing because we’re all so much more than that. But that’s the great thing about life. There isn’t just one thing that we can do; the world is full of wonderful things we can do. Are you ready to create your own destiny? Our destiny isn’t decided for us, it’s not divinely given to us when we’re born – we shape our own destiny. The important thing is that we take that first step because without it, it’s far too easy to feel like we’re living in chaos (when we don’t have to be). Venture out, leave your comfort zone and take that first step – while you won’t have all the answers right away, it will all start to fall into place in time. You can’t rush the process, things will unfold in time and that’s the way it should be. The journey is as important as the destination. Adam used to manage the content marketing efforts for brands earning well over 8 figures in annual revenue. Now he teaches entrepreneurs how to create a blog that thrives in a noisy online world over at BloggingWizard.com and here on his personal blog. Interesting fact: Adam can 'split the atom' on a yo-yo. Actionable content to grow your business. Delivered. Newsletter subscription includes fresh content, deals, and more. Unsubscribe anytime.